Hate Sweeping & Vacuuming Cat Litter? After a long day, who wants to be bothered with cat litter all over the floor? It's very messy and quite awful to walk on. A standard litter mat or maybe a simple rug you've placed in the area isn't really doing the trick. You're left facing the same issue day in and day out. Unique 3d bumps to trap & remove litter from your cat's paws. BEFORE reaching the rest of the house. Double layer design structure that holds spilled litter in a pocket until it's dumped for re-use, back into the litterbox. It can be used as a scratcher for your baby. Providing an outlet for stretching and reducing destructive behavior. Super Easy Cleaning - Just rinse w/ water and wipe dry. Anti-Slip to increase safety. It can even serve as a Door-Mat for wet, muddy or dusty feet. Saves Money - Return Excess Litter to the Box! You'll be walking around barefoot👣again in no time! Available in 2 Sizes and Colors. 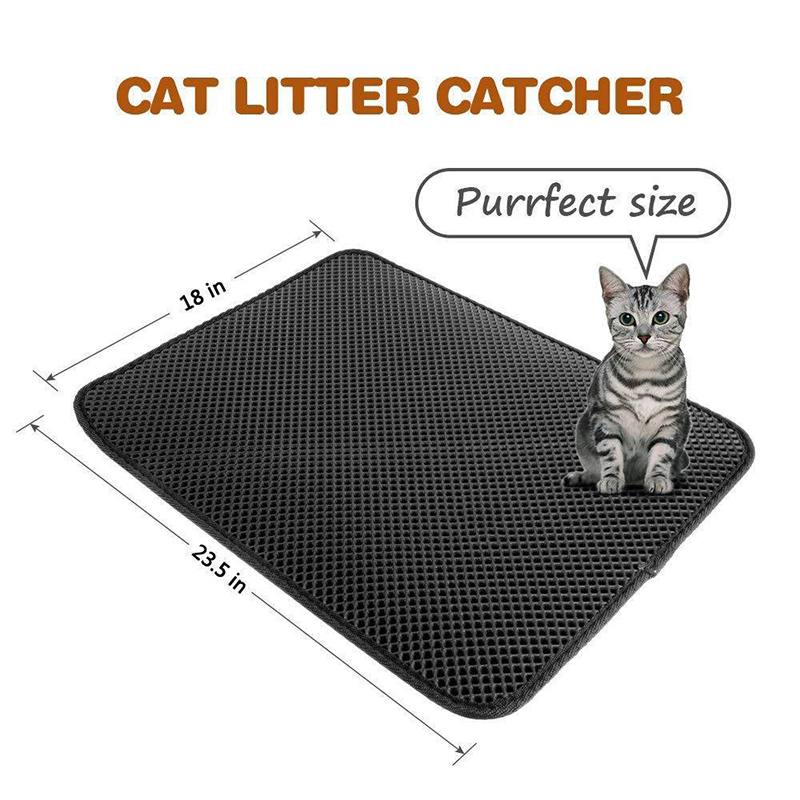 These multi-purpose Litter Trapping Mats are going fast and Cat-People are Loving them. Even if a smart aleck kitty pees on it, the "Puppy Pad Option" has you covered! We'll Pay to Ship it to You, Worldwide. You've seen it in action. Click Add to Cart and Lighten YOUR Cleaning Load Now. Saving you work in 7-10 Business Days. EXTRA $10 DISCOUNT🤑If you buy 2 or More: Just choose the "Twinpak" containing 2 per package via the Color Drop-Down Menu. Buy More. Save More. Get the Special Deal for a "Twinpak"! Buying items online can be scary. So we want you to realize there is absolutely NO RISK in giving it a try. Phone orders welcome too. Feels strong and looks good. right size. not tested. the product fits the description perfectly. Really fast shipping, I absolutely recommend this product. MAT is as the picture. Like me and котикурекомендую!!! Very fast delivery, have a little smell, and everything in the description, Thank you, see how it works). Very good item, me and my cat are very happy. Très Bien et livraison rapide merci ! пользуюсь a few days, really work mat! buy rest assured! packed and fast delivery thank you for seller. It’s better than not having one. It catches most of the litter.I like that it stays in place and doesn’t slide all over when the cat jumps in and out. It works. I am very happy with it. I haven't swept any litter since I got it. And I got it pretty fast. Thanks. Mat fits the description, high quality. Cat tested, mat remained intact. Its functions are carried out. Goods seller recommend. Just as in the description, cool mat, my cat just checked, smell small, recommend. satisfied, very fast shipping ,I recommend. first shipment got lost, but after contacting the seller they resent the Matt and it arrived in less than 2 weeks! Exactly as described, works perfectly. Delivery in 2.5 weeks in the Netherlands. Was hoping for a miracle, no litter... But this is working great. There is still litter in other places in my house beside the litterboxes! But the amount reduced significantly! There was a mistake made with the colours, but the buyer solved it very quickly for me. Very grateful!